What a race! Magento and Beutler Ink teamed up once again to design the ecommerce platform's newest ebook, "Masters of Commerce: Marathon Tips for Merchants & Developers." The ebook features advice and tips from 20 Magento Masters, the developers who led the community in contributions in 2017. We used a marathon theme for the design to celebrate the community’s shared passion for the sport. 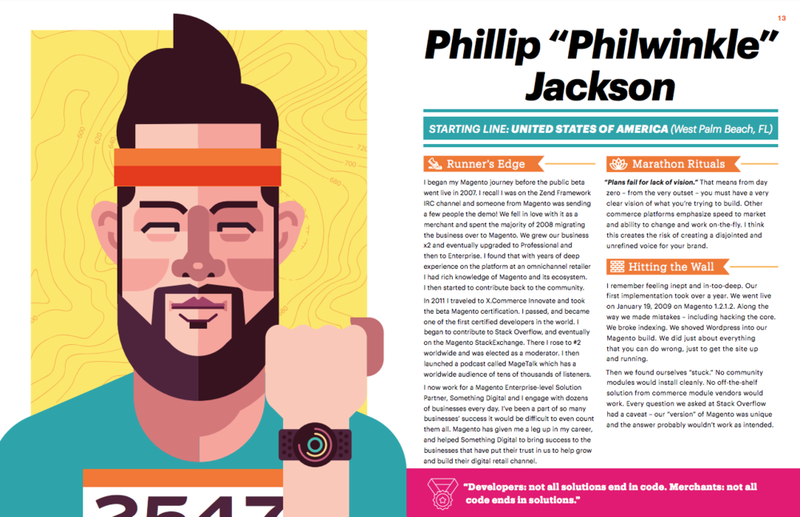 From racing-inspired layouts to caricatures dressed in running gear, we made an eye-popping design that yielded one of Magento's highest click through rates in latest content campaigns, and supported record-breaking homepage traffic during its launch. The piece expands Magento's advocacy initiatives as a celebratory compilation of the community's most active contributors.